He is a cheap shot artist and a suspension magnet. He is known league-wide as one of the dirtiest players in the game. Matt Cooke? No. Jarko Ruutu? Nope. Sean Avery? Wrong again. We don't think of him like that at the moment. We are talking about Chris Pronger. Classless Chris P.
Why do the other names pop into mind though? Because they have run afoul of the NHL code of conduct more famously? Actually, just more recently. Additionally guys like Cooke, Ruutu and Avery play a nasty game and make no bones about their intent. Yet, they will apologize when someone gets injured. No fun for the guys who write the stories. It's much more exciting to perpetuate controversy. 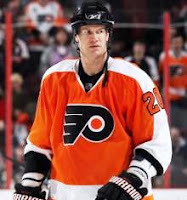 In case you have only a media member memory, hit up YouTube using the search words "Pronger" and "elbows" and you will find a long list of videos. Better yet, "Pronger Stomps on Ryan Kesler". A classic example was delivered this past week when Pronger decided to deny the Blackhawks of both Game 1 and Game 2 game-winning goal pucks. Where's the puck, Pronger was asked. "It's in the garbage," Pronger replied. "Where it belongs." Ahhh, what a leader indeed! After taking the Game 1 puck, the Flyers lost... again! The Hawks must have really been intimidated by Pronger's sore loser act. NHL.com used a headline "Method to madness of Pronger swiping pucks". 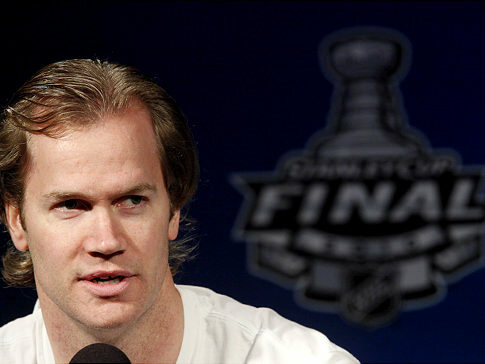 "It is the Finals," Pronger said. "There are an awful lot of you guys and it's an awful lot of questions. Some of them can be monotonous. You know what, you have to enjoy the moment. It's not every day you have the opportunity to be here at the Stanley Cup Final. You have to relish it." And while Pronger is clearly having fun with it, there is a definite method behind the silliness. Yes, hes just so silly... and fun... and a childish chump. Being cheap is not being a leader. Repeating the same pathetic act after failure is not intimidating or creating a psychological war with the other team. It just creates any easy story for the media to run with. Sorry Chris, there are no free passes here.